Many historic shops and workshops, ancient crafts and trades are disappearing from the centre of Rome. But not all. Sometimes an enterprising individual will come along with the passion, and the vision, to breathe new life into a family business of the past. 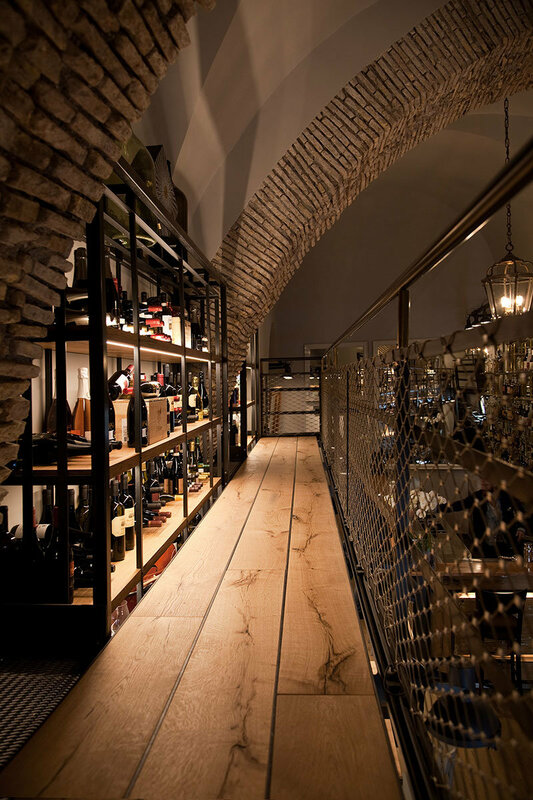 In this spirit, the Santarelli family, active in the wine trade for more than a century, launched a project to revive Piazza Capranica’s historic “Wine & Oil Store” in a present-day style without sacrificing the ambient mood of the 1930s. “Collegio” takes its name from the nearby Via del Collegio Capranica, where, at number 41, the formal address of “Berardino Santarelli & Sons”, this story began. 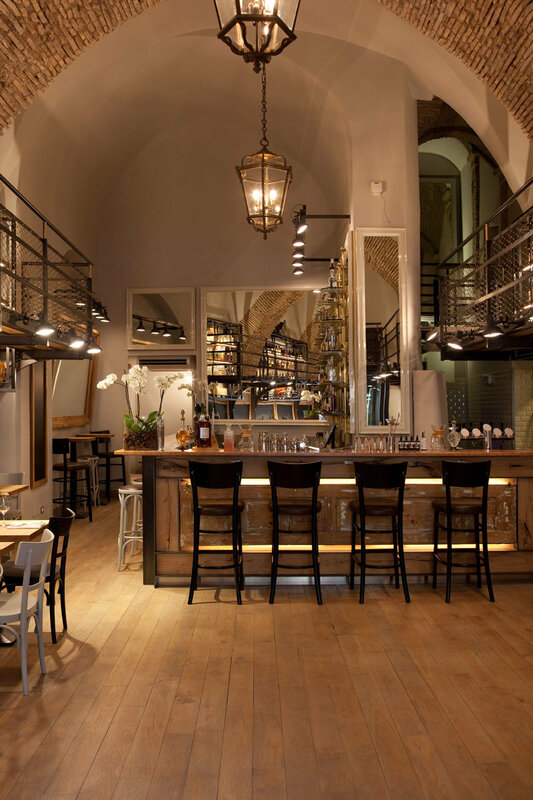 Piazza Capranica’s historic winery has been transformed into a contemporary venue where customers can enjoy dishes inspired by the Roman tradition and locally sourced produce, paired with delicious wines and signature cocktails. Almost a century later the original outlet has taken on a new lease of life in line with the traditions and entrepreneurial spirit of those earlier times. Recovery was the byword that drove the project of architectural restoration, inspired by the “Vini & Olii” of the 1930s; recovery of authentic materials like iron, wood and leather; recovery of the clean lines and the sombre yet welcoming elegance of the original shop housed in the ancient Palazzo Capranica built by Cardinal Domenico Capranica in 1451. Our primary objective was to preserve the atmosphere of the past through an accurate restoration of the late Renaissance structure, reinforced by imposing eighteenth century arches. Iron shelving in the style of that once used for the storing and display of bottles was installed within the two large rooms whose original wrought-iron framed windows face directly onto the Piazza Capranica. 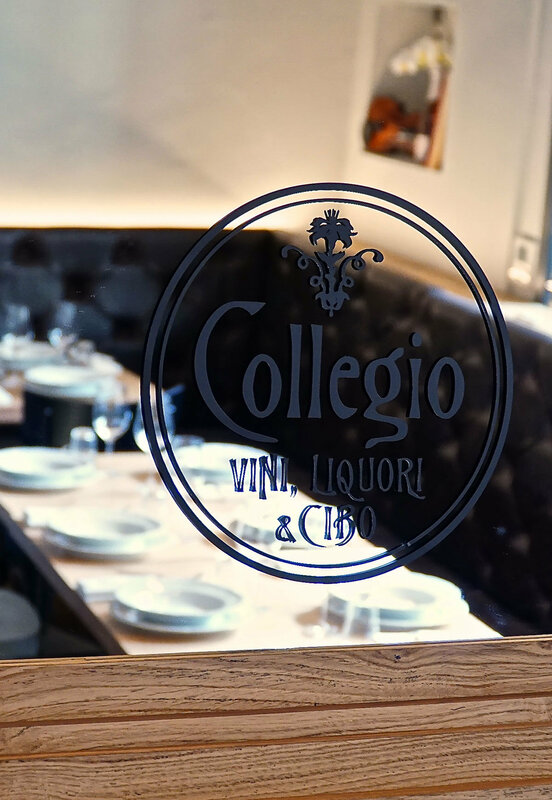 From the door, the eye takes in the imposing bar counter of reclaimed wood and red Verona marble, the oak tables, leather chairs and large framed mirrors which reflect the vaulted ceilings, carved capitals and surrounding iron balustrades This is the heart of “Collegio”. The centrepiece of the second and main dining area is the Gastronomy Kiosk overflowing with cured meats, cheeses and other delicacies. Just glimpsing it tickles the palate, makes the mouth water and stimulates the imagination in anticipation of the gastronomic delights to come! On a normal day the two rooms can accommodate up to 70 customers. Both rooms are available for private hire however and up to 45 customers may be accommodated in each. In the near future we hope to create an outdoor dining space overlooking the Piazza Capranica, famous in the eighteenth century as a market place where vintners from the surrounding countryside sold their wine by the barrel. “Collegio” adheres to Rome’s prestigious “Association of Historic Shops of Excellence”.